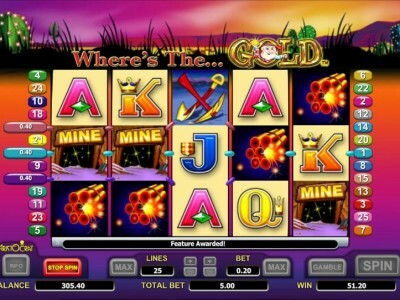 If you are into Australian pokies then you will be familiar with the Where’s The Gold pokies by Aristocrat. This slot has so much personality through it’s bonus it is no wonder it has been voted one of the best Australian pokies of all time. When playing this Australian pokie machine you will come across a dynamite (SCATTER), Minor, Mining Pick, Mine and Mining Cart symbols. This is an mining inspired game which also includes the A, K, Q, J symbols. You can pay between 1 to 25 paylines and symbols pay left to right. 3 or more of the scattered DYNAMITES win the incredible Where’s The Gold bonus. Here you can win up to 10 free spins with up to 3 wild gold symbols. You will be presented with a number of characters and the one you pick determines how many additional wilds you receive along with number of free spins. Lucky the Where’s The Gold aristocrat pokies has hit online as it is usually hard at a casino to get you hands on this hot machine. Features can be re triggered and the number of features left is indicated by the number next to the nugget. No wonder Where’s The Gold is the most popular Aristocrat pokies of all time! Have a play on our demo game by clicking the link above.